Luxurious custom patio home in exclusive Preston Gate. Private entrance. Beautiful drive up. Extensive crown moldings & plantation shutters. Formal Dining. Open Kitchen featuring furniture style glazed cabinetry, double ovens & gas cooktop. Living has high ceiling & gas fireplace. Master Suite includes stone floor in bath & charming tub alcove. Home Office has wood and marble floors. Garage with epoxy floors & extra storage. Gameroom upstairs with wet bar & full bath. 2nd beds share Jack & Jill bath + extra 12x7 Bonus room for exercise or play area. Recent paint, carpet, appliances, roof, water heaters, heat & air. HOA includes front yard maintenance. 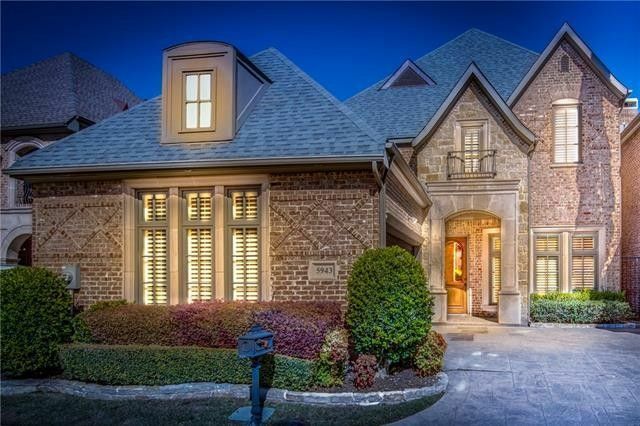 Exceptional Lock and Leave style retreat in Dallas! Directions: One Block South of LBJ on Preston Road. West into circle drive at Preston Gate Court. Enter the gate and 5943 is 3rd home on the right. Exclusions: Exclude all TVs, mounts can stay.